I love to look at water, cool pools, lazy rivers, lakes and the mighty ocean. Water is just beautiful to watch. During mid June we had the honor of coordinating Heather and Grant’s wedding at her Uncle’s beautiful home overlooking the Magothy River. Heather and Grant grew up in the Atlanta area however Heather’s family originates from Maryland. 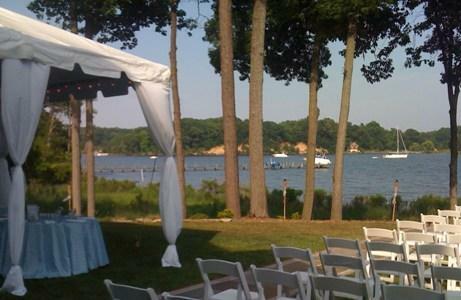 So Heather decided to fulfill her dream of a Maryland wedding at her Uncle’s house. With all outdoor weddings, I keep a vigilant watch on the weather forecast for updates on what to expect. The forecast called for sunshine with a bit of humidity but no rain. Great!! As guests arrived they were greeted with Ice cold Water and Lemonade with warm welcoming music from the Mellowtones. The ceremony music began at six o’clock. 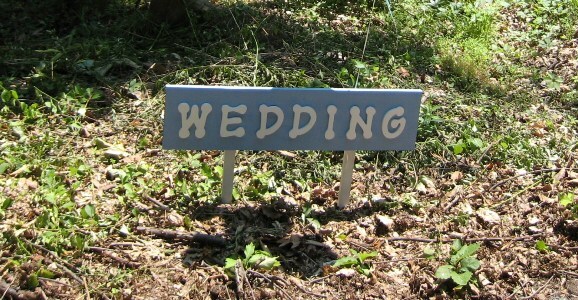 Heather and Grant had opted not to have a bridal party, only Grant’s nephew who had the honor of being a ring bearer. 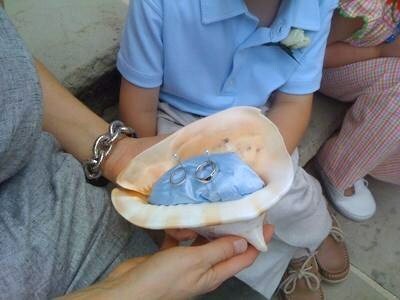 And fitting of a Maryland waterfront wedding, rings were carried in a conch shell. Once the ceremony was over, guests enjoyed light hors d’oeuvres and refreshments including a wonderful Margarita mixture based on a recipe from Heathers Mom. 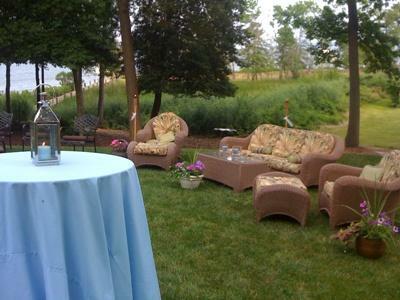 Lounge seating, tiki torches and silver lanterns set the mood on one side of the lawn, while the other was tented for dinner and dancing. Guests enjoyed a wonderful grill station with tenderloin, lamb chops and salmon grilled to order. Delicious Pasta with Shrimp, Caesar Salad and Asparagus were accompaniments. After everyone had plenty to eat, it was time to dance! Deejay Carl Bashiers did a super job keeping everyone up on their feet and moving. After the last dance at 11pm, it was time for guests to say goodnight to Heather and Grant. Everyone held sparklers and lined the walkway leading to the dock. Heather and Grant made their way down the sparkling arch and boarded her Uncle’s boat for a wonderful getaway. They spent their first night as husband and wife at the Annapolis Marriott and then it was off to Greece.